Mayan Dream: “Spirals compose the most basic geometry of life and speak to us on a level of our deepest knowing. Spirals both curve and move in an angular spirals. The design at the top and sides is painted on a wall in the ruined Mayan city of Palenque, in Chiapas, Mexico. It is symbolic of the beginning, the germination, the essence, and the seed from which all life springs. In the background is the Temple of the Inscriptions. This temple contains the tomb of the Mayan king Pacal the Great, whose sarcophagus has been the subject of much research and conjecture. 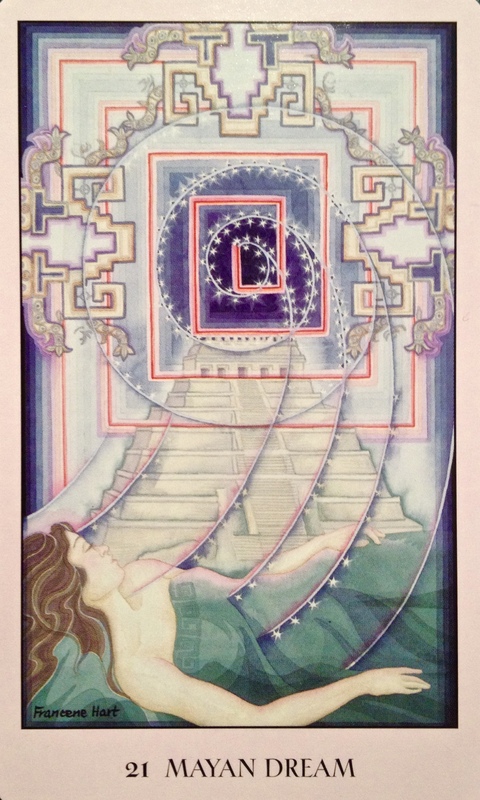 In choosing this card you are asked to enter dream time and find the inner journey to your spiral beginnings. As spirals are the purest form of moving energy, you can travel the spiral dream journey to the level of subatomic particles and watch them reveal their spiral vortices. You can also travel to galaxies, watching the magnificent dance as they go spinning through space. The spiral is the very heart of creation, the building block of all that exists in the Universe. Studying Sacred Geometry builds new neural pathways in our brain, allowing us to access deeper states of wisdom and ultimately, higher consciousness. When we meditate on the spiral of life, we can start to increase our comprehension of the higher dimensions, or realms, available to us if we are able to release prior limitations in our thought patterns. It can literally allow us to set our minds free in order to make a much deeper connection to our Soul, or spirit. This card reminds us that the path from what we desire and it’s manifestation is not always a straight line, but much more often a spiral journey to be experienced along the way. We humans think so linearly… past, present and future… have or have not, yes or not, black or white. Yet the Universe is not a straight line, it is a spiral journey of Love and Light. When we surrender to this beautiful journey and know that we cannot always control how we want to manifest our dreams; we give the Universe permission to get creative. When we set out to explore the possibilities with an open heart and open mind, we invite miracles and abundance in. Pay close attention to your dreams right now, and use them to access the perfection of your own spiral journey.